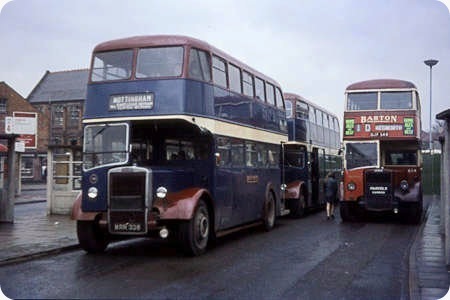 A fine array of Leyland Titans caught in Loughborough Bus Station in early 1970. On the left is South Notts. 48 (MRR 338) a PD2/12 with Leyland L27/26R body new in 1951. Behind it is one of their PD3’s with unusual Northern Counties forward entrance lowbridge bodies. To the right is Barton 834 (DJF 349), a venerable PD1 with Leyland H30/26R body, new to Leicester City Transport as its 248 in 1946, and purchased by Barton in 1959. That’s a lovely surprise on a Sunday morning! Loughborough was one of my regular haunts in the early 1970s and your photograph made me feel that I’d travelled back in time. South Notts were a classy act and one of my favourite independents. By 1973 I was living in Nottingham, got married there (on a very low budget) and travelled from the registry office to the reception aboard a South Notts Lowlander from Broadmarsh to Clifton. Fond memories. If I ever get round to writing "Independent Buses in Derbyshire and Nottinghamshire" (should be around 2015 if I’m still compus menti by then! ), I’d love to use this image on the front cover. Neville, I didn’t know such a thing was in the pipeline. That’s a lovely surprise for me on a Sunday morning! Having been born and bred on the Derbys/Notts border, I have memories of some of the operators and a great fascination for the ones which were before my time. I wish you the best of luck with it and look forward to it very eagerly indeed! One of my favourite independents too, Neville, having lived in Loughborough and surrounds since 1968! I do vaguely remember riding on this bus, and, more vividly, the later Weymann bodied ones. A truly fascinating and well run fleet, and a garage at Gotham which I could never drive past. I do have a full fleet list for South Notts, should anyone be interested, and I would love to know of any progress on the (LT2?) Lion at Ruddington. The PD2 was almost certainly operating as a duplicate to the PD3. South Notts always operated a duplicates policy, rather than improving the basic frequency, with the result that at busy times one advertised journey could consist of five buses. The two from Loughborough would be joined by a further one from East Leake, yet another from Gotham and a final one from Clifton. When Nottingham City Transport took over the business, the frequency was increased to a regular 15 minute interval between Nottingham and Loughborough with no increase in the vehicle output required. What this view also shows is how attractive the final Leyland body design was even in lowbridge format. With other manufacturers, the lowbridge version looked too much like a squeezed version of the highbridge original. I wonder if the duplication policy was due to fact that in those regulated days they probably would have had any application to increase frequencies refused. Three different operators ran three different routes and although it’s unlikely that Barton, being a close associate, would have objected, perhaps Trent would have raised an objection on the grounds that increased frequency could have abstracted end to end users. I’m sure British Rail would have objected too. Nevertheless, for anyone wishing to travel from Loughborough to Nottingham, what a fabulous choice of vehicles! My word Alan, FIVE vehicles on one scheduled departure !! I thought we probably held the record at Samuel Ledgard’s with four (all double deckers as a rule) on the 5.30 pm weekday departure from Leeds (King Street) to Ilkley. First in line was the 5.27pm to Rawdon (app 8 miles) followed by the 5.28pm to Guiseley White Cross (app 10 miles) and 5.29pm and 5.30pm to Ilkley (16 miles), the latter being the normal service vehicle. All were very well loaded at the terminus stop and, once on the road, virtually a full load was carried on each. These were the days when, other than monthly contract tickets, almost every passenger paid the full fare, or used the homeward journey on Workman Returns, and operators knew where they stood as far as revenue and outgoings stood. You’re so right, Chris B. They were not such halcyon days for small operators, with the Traffic Commissioners to contend with and protectionism reigning supreme, not always in the passengers’ interest. You only have to read the book about Basil Williams (Hants & Sussex) fights to see the difficulties. I know some folk dislike/despise deregulation, but the previous system was far from perfect. In modern parlance, we need a ‘middle way’! Chris B may well be right. I certainly don’t think Barton would have objected – their Nottingham to Loughborough 10 was too long and circuitous, and probably little used for through journeys. (The ex-Leicester PD1 is a Kegworth short working – the through service was invariably a coach). From Nottingham the route was Beeston, Chilwell, Long Eaton, Kegworth, Sutton Bonington and Hathern (with some journeys also diverting to serve Lockington, Hemington and/or Kingston on Soar). Overall journey time was about 1 hour 20. Trent with their route 66 (straight down the A60) was the competitor for direct journeys. Chris H, we had a middle way. The Fowler Transport Act of 1980 was trumpeted for its deregulation of coach services, but this much publicised feature masked a much more important change – the presumption in favour of applicants for Road Service Licences, which replaced the often insurmountable bias towards existing licence holders. The old stranglehold of the big companies was removed at a stroke. Deregulation had nothing to do with improving the state of the bus industry. It was driven by Ridley’s rabid hatred of state enterprise, and his determination to inflict damage upon the large Transport and General Workers’ Union, and thus Labour Party funding. His motivation was totally political. Deregulation has been a disaster. Remember Darlington Corporation and similar instances of bullying by the big boys. We now have powerful regional monopolies that can do exactly as they please and charge the public whatever they wish. If I recall correctly, Roger, the Fowler Act did introduce limited de-regulation and with it introduced government subsidies for services for which reasonable fares were being charged, but which were unprofitable. However, certain very Left-Wing Labour authorities (GLC, Merseyside and South Yorkshire are three that come to mind) cynically ‘milked ’ the subsidy system by charging unreasonably low fares and producing loss-making situations and would not respond to government edicts to put the fares up again. The drain on the public purse was such that a government reaction was inevitable. And the rest, as they say, is history! I understand that under Road Service Licensing duplicate journeys could be operated up to five minutes in advance of a scheduled departure and up to five minutes after a scheduled departure without the need to register the additional journeys. This arrangement was used by Barton Transport in the late forties and early fifties, I further understand, on their Nottingham to Derby service thus turning a 15 minute service into a five minute service at various times on a Saturday. As a regular on the Nottingham to Loughborough service in 1972-74 I can assure you that South Notts received very little "end to end" competition from the Trent operation – the fares at that time were almost double those of South Notts and the journey time almost the same. And people still wonder why I prefer independents! I believe there was a legal requirement that vehicles operating duplicate journeys had to display a sign indicating such. Many operators simply displayed DUPLICATE on the destination screen, in the case of Trent, most of their half cab vehicles had a small hinged cast plate under the canopy which could be folded down when required. By the time of John’s photograph, does anyone know if this requirement had been rescinded? I was also going to mention Trent’s duplicate plates. Many operators just used the destination blind, which was fine as long as the bus was immediately behind the vehicle it was shadowing, but that didn’t always happen. I remember my mum having a row with the conductress after boarding a bus so destined at Ollerton, when returning to Nottingham. After presenting her (Trent) return ticket, the conductress asked "Can’t you read? This is the Mansfield bus." "Well that’s not what it says on the front." "Oh yes it is." "Oh no it isn’t" "Oh yes it is." "Well stop the bus and go and look for yourself then!" Chris, there is nothing wrong in principle with the support of public transport with public funds. The rail system receives enormous sums in support, and Transport for London receives a hugely disproportionate subsidy in comparison with the provinces. The effect of deregulation upon bus patronage in metropolitan areas has been devastating, and having wreaked their damage in the cause of profiteering, several of the big groups are now withdrawing from major provincial conurbations and smaller urban concentrations. It isn’t that these areas cannot be run profitably. It is because the operators seek excessive margins to show eye watering profits in their annual reports to keep the City financiers happy and hence the share price high. Some of the half cab saloons of Yorkshire Woollen notably the large batch of Brush bodied Leyland PS1s had a pull down plate proclaiming Duplicate Car. Well said, Roger! In addition to the demands of the shareholders, there’s the small matter of clowns like the OFT who object to a sale of depot from firm A to firm B because A isn’t making enough there to satisfy said shareholders. They say it’s uncompetitive, and A shuts depot anyway, thus saving firm B the agreed several £££££££. Can someone give me the date and time of the revolution? When Trent bought Barton’s "buses business" why didn’t they purchase Barton’s shareholding in South Notts? And then later, why did Trent allow South Notts to fall into the hands of NCT? Their actions with regard to the recent disposal by the Felix company of its stage-carriage service were completely different – and from what I’ve read above the South Notts operation must have been quite a money-spinner. Why did Trent (feel able to?) let this slip their grasp? By the time NCT acquired the assets, services and good will of the South Notts Bus Company but not the Company itself in March 1991, South Notts had been subject to severe and sustained competition, since May 1990, on its East Leake – Nottingham service and its Clifton Estate services from Kinch-Line. This competition caused both Arthur Dabell, the South Notts MD, and the Board of Barton Transport plc (Barton Transport plc having retained its shareholding in South Notts when it sold its own bus business to Wellglade Ltd in 1989) to say that action was needed to resolve the financial losses that South Notts was now suffering. The action was to sell out to NCT, with whom South Notts had maintained good relations since October 1986. I’ve often wondered why support for South Notts on its service between East Leake and Nottingham gave way when Kinch-Line started to compete. As a former resident of Clifton, but way before Kinch-Line arrived, I can say that there was a tendency to catch the first bus that came along whether it was NCT, West Bridgford or South Notts so there was not the same brand ‘loyalty’ there. Maybe the money South Notts made on its Clifton services, always charged at NCT fares, which were not excessive, had for many years given it a financial cushion allowing support of its cheap fare policy on the main line service. Since the 1985 re-organisation of the Clifton services (allowing NCT to introduce 100% driver only operation on its Clifton services) South Notts had 100% operation of the 67 and 68 via Trent Bridge, and its was these two services that were subject to Kinch-Line competition. There was talk of privately expressed surprise by South Notts ‘management’ back in 1968, when West Bridgford sold out to NCT, that West Bridgford couldn’t make money on ‘Cliftons’. We shall probably now never know why South Notts didn’t trade on its ‘good name’ and long tradition of serving the East Leake – Nottingham corridor to counter Kinch-Line back in 1990. Did Barton Transport plc want their money out while there was something left to sell? Philip, An interesting question which I’m unable to answer but a perfect illustration of the old saying ‘What goes around comes around’ occurred this week. Trent abandoned their old Nottingham to Loughborough service many years ago but when Premiere Buses of Nottingham collapsed last Friday, Kinchbus, which belongs to Wellglade, who own Trent, stepped in and have now taken over operation of the No.9 service which was partly the old Trent service and partly the old BMMO X99. The difference is that the old Trent 65/66 used to deviate via Wymeswold and was basically every two hours between Nottingham and Loughborough, todays service which retains No.9 with Kinchbus is half-hourly and by operating direct between Rempstone and Loughborough, about twenty minutes has been lopped off the running time. So you could say the service has come back to Trent’s parent group and in response to Neville’s comment, I don’t think Wellglade will be charging the fares that Premiere charged for very long! Kinch (under its Wellglade ownership) was already running a Loughborough to Nottingham service via the A60 before Premiere travel came along. So although they took over the Premiere no. 9 service, they were already there. Brian The Kinch service 9 which competed with Premiere was withdrawn in March 2012; Premiere then had the route to themselves, until they ceased trading on 25 January 2013. Kinch reappeared on the route the following day. Digressing along the late, lamented X99 route for a moment, the diversion via Loughborough predated Arriva. A basic summary is that when Midland Red was split in 1981, the X99 continued to be operated by Tamworth and Coalville garages, which were allocated to MR (North) and MR (East) respectively and thus the X99 became a joint operation. Some time between around deregulation, possibly during the 1987 "Night of the Long Knives" MR (North) pulled off the X99, leaving what was by then Midland Fox in sole charge. Fox retrenched in turn, pulling the X99 out of Birmingham and reduced the service to Ashby to Nottingham, which it extended at one end to Coalville and diverted via Loughborough, pulling off the traditional route via Castle Donington. I lost track of it by the 1990s, losing interest in buses for a decade or two, but I seem to recall the route ended up running as the 99 and didn’t last too long once Fox was Arriva-d and the money-men took over, turning the whole Arriva bus operation nationwide into First-with-a-prettier-livery. My Mother was a friend of Chris Dabell’s wife and they often travelled together on the South Notts bus to Loughborough or Nottingham. Mrs Dabel would remark that "Chris would sooner see a bus filled with happy passengers enjoying the trip than putting up fares and having a lesser number of passengers. I often booked South Notts for the Sunday School outings and sometimes got alternative quotes. The South Notts were always the best price, and obligingly picked up people in the village and dropped them of at different points on the return to East Leake. South Notts also supplied busses to Skills on their Scarborough and Bridlington Saturday runs also a Yorkshire firm(?) Boddy’s would help on that run. South Notts were always the last busses to stop running in bad weather (fog, smog, snow amd floods.) Other companies withdrew services early in the day which meant that the school passengers were allowed to leave school early. South Notts just kept running …… no early school leaving for us. Duplicate busses, always on Saturdays. South Notts also "delivered" newspapers to villages on the Nottm to Lougborough route!. (and parcels collected at the various bus stops). South Notts did have a rival during and after the war. A bus came from Nottingham to East Leake every morning and evening. This bus brought staff to the "Control Centre" at East Leake Station. This bus (can’t remember the operator) was some times a double decker and made the journey via Ruddington and Wilford Hill. A real treat for us as children to travel on a "foreign route". I recall the first Double decker. Which had been repaired on the top half using a panel from a Wigan Corporation bus. The panel had been painted South Notts blue, but the Wigan Corporation logo was visible through the paint.